Wales full-back Leigh Halfpenny expects to miss the 2016 Six Nations after being ruled out of the Rugby World Cup with a knee injury. The 26-year-old Toulon player ruptured anterior cruciate knee ligaments during the 23-19 win over Italy and underwent surgery on Tuesday. He said: "To be ruled out of a World Cup after going through all the tough training... was devastating. "I'm just thankful that I will be back in six to eight months." 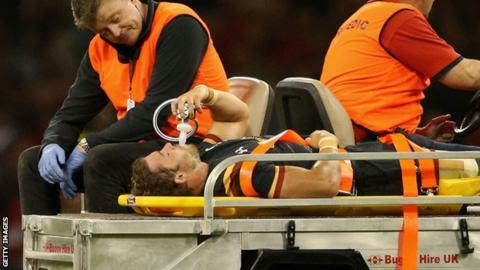 Halfpenny, a former Cardiff Blues player, said he realised the seriousness of the injury as he lay on the Millennium Stadium pitch. "As I planted my right leg I felt my knee jar," he said ahead of his operation. "I heard something snap and I just remember being on the floor in agony. "I was already thinking it could be my World Cup done." Halfpenny wore strapping on his right leg for the game - Wales' final warm-up match before the World Cup - and his subsequent injury prompted a debate about whether he should have played. He said: "I was absolutely fine to play. The injury is not related to the strapping I had on. It helped with my kicking too. "I had no doubts about taking the field for that game." Writing earlier on Twitter, he thanked fans for their support and backed Wales to win the World Cup in his absence. "Whilst I'm gutted I won't be able to see through this particular journey, I've no doubt the squad has what it takes to go all the way," he said. "Along with the rest of the country, I'll be passionately cheering on the Welsh boys and would like to wish them all the very best." Scrum-half Rhys Webb was also ruled out of the World Cup after injuring his ankle in the same match. Halfpenny's likely replacement at full-back, Liam Williams, has not played since having foot surgery in June. But Wales head coach Warren Gatland says Williams will start their World Cup opener against Uruguay in Cardiff on 20 September. The other two potential full-backs in Wales' 31-man squad - Bristol's Matthew Morgan and Newport Gwent Dragons' Hallam Amos - have six caps between them. After starting their World Cup campaign against Uruguay, Wales play hosts England, Fiji and Australia their remaining Pool A matches. But they will do so without Halfpenny, who was part of the squad that reached the semi-finals in 2011. "I am devastated not to be taking part in the World Cup but injuries are part of professional sport and life has to go on," he added. "I want to thank everyone for the immense support I've received. It has been truly humbling and overwhelming." Back-rows: Taulupe Faletau (Newport Gwent Dragons), James King (Ospreys), Dan Lydiate (Ospreys), Justin Tipuric (Ospreys), Sam Warburton (Cardiff Blues, capt), Ross Moriarty (Gloucester). Wings: Hallam Amos (Newport Gwent Dragons), Alex Cuthbert (Cardiff Blues), George North (Northampton Saints).